They had already attempted to refresh the view definition using the sp_refreshview system stored procedure as mentioned in one of my previous posts on refreshing the view metadata for non schema-bound view. As I finished my investigations with them I realized that their view, although created without SCHEMABINDING, was created with the best practices of having a clearly defined column listing. Changing the names of the underlying columns (or even dropping any column) therefore requires us to drop and recreate the view. Such views should be evaluated for use of the SCHEMABINDING clause. The SCHEMABINDING clause will prevent the changes to the underlying table because SQL Server would be able to detect that dependent objects will be affected by the change. Object ‘dbo.ProductList.VendorName’ cannot be renamed because the object participates in enforced dependencies. SCHEMABINDING therefore helps to prevent breaking any dependent objects as a result of a base object change. 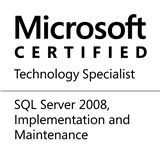 This entry was posted in #SQLServer, Blog, Imported from BeyondRelational and tagged #SQLServer on November 4, 2013 by nakulvachhrajani.